As social media stocks get slammed on regulatory concerns, the broader technology sector was also under pressure Wednesday and Thursday. Something's already ailing chip stocks and memory demand appears to be slipping, leading some analysts to blame weakness on trade wars. Tech stocks could come under new pressure if President Trump goes ahead with tariffs on $200 billion in Chinese goods, but it's not clear how much impact there will be on individual companies. Twitter CEO Jack Dorsey and Facebook COO Sheryl Sandberg appeared before the Senate Intelligence Committee Wednesday, testifying that they have improved their ability to thwart foreign interference with their services. Their stocks were hit Thursday for a second day, and traded lower amid a broad decline in technology. Chips stocks were slammed Thursday, after Morgan Stanley warned about weakness in memory and KLA Tencor told investors at Citigroup's technology conference that its December quarter would be up less than thought due to weakness in the memory market. Micron led a decline in chip stocks, losing nearly 9 percent. But also at Citi's conference this week, Analog Devices, off 1.5 percent, discussed weakness in industrial, possibly due to trade issues and tariffs, according to analysts. STMicroelectronics, off 1.8 percent, said at the same conference that its recent bookings were "volatile." The Trump administration is considering tariffs on another $200 billion in Chinese goods, after a comment period expires at midnight, and China has its own list of tariffs on $60 billion in U.S. goods. Slowing in semiconductor equipment and chips is sometimes seen as a canary in the coal mine for global growth and tech. Analysts said it's unclear how much is related to trade worries, but it may have some connection. Micron, Qualcomm and Intel are among companies with the most revenue exposure to China, according to Strategas. "I think demand has been weaker. It's well-documented that Apple's been carrying quite a bit of inventory throughout the year. What I think is what's going on between the U.S. and China in terms of trade has had an impact as well. It's both demand and supply," said Romit Shah, Nomura Instinet senior analyst, on CNBC's "Power Lunch." "I think the sector is very fragmented so what you're seeing in memory today doesn't necessarily mean it's going to spill over into analog and wireless." 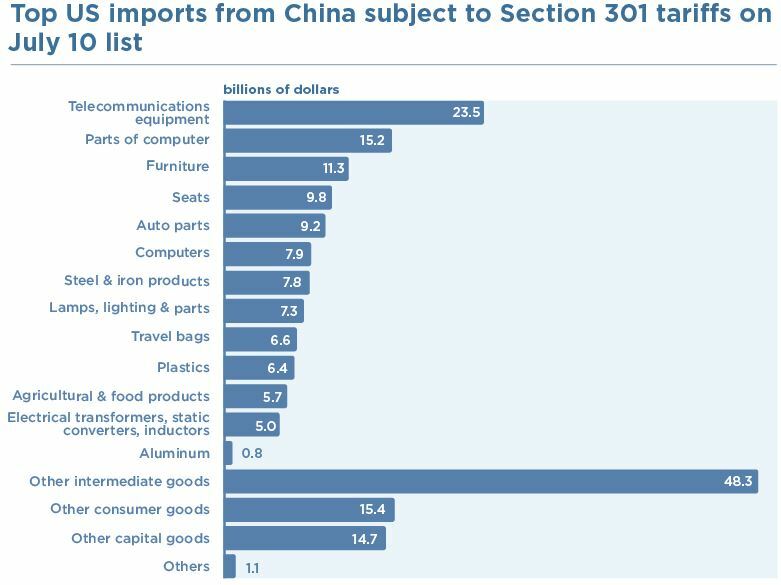 According to the Peterson Institute for International Economics, the initial list of possible targets from the U.S. trade representative on the $200 billion in goods, includes tariffs on more than $15 billion in computer parts and $8 billion in computers, in addition to the top product, $24 billion in telecommunications equipment. The tariffs would be in addition to tariffs on a previous $50 billion in Chinese imports and on steel and aluminum. According to Peterson, China has so far not specifically targeted semiconductors. "Forty-seven percent of the U.S. import tariffs are on intermediate goods, and most likely the tariffs will raise their costs and make U.S. technology companies less competitive," said Lucy Lu, research analyst at Peterson. "The U.S. companies will either absorb these increasing costs or pass the costs to consumers." Social media stocks were dealt another blow Wednesday when the Justice Department said Attorney General Jeff Sessions will meet with state attorneys general this month to discuss concerns that tech companies "may be hurting competition and intentionally stifling the free exchange of ideas on their platforms." Trump has complained about bias and said Facebook, Twitter and Google were "treading on very, very troubled territory and they have to be careful." Google was invited to the senate hearing but none of its officials attended. "While exchanges between legislators and tech executives were more amiable than what we heard previously, it was impossible not to come away with greater conviction that social media's opex/capex investments in tools to address bad actors on their platforms are likely to maintain an aggressive trajectory, as FB and TWTR strive to show they are trying their best to remedy these issues," wrote Evercore analysts. They said investment in safety and security is not new at the companies. But some analysts say the risk of trade wars is greater, and other tech names that have ties to China could be at risk. The tariffs are expected to hit companies unevenly, but analysts stress it's not clear exactly how they will be impacted. "The belief that Apple is somehow immune to this is delusional. ... Whose to say China doesn't put tariffs on Apple?" said Peter Boockvar, chief investment strategist at Bleakley Advisory Group. "Some analysts have been concerned that U.S. companies could be boycotted or given a hard time with regulations or other issues, even if they are not affected by tariffs." "China clearly will retaliate. It's not going to be positive for the market. The real problem is as tough as this talk sounds. The bulk of the tariffs don't currently affect the consumers directly but these will and retaliation will. China first came after the farmer. Now they'll go after the consumer," said Art Hogan, chief market strategist at B. Riley FBR. Hogan said it makes sense that the consumer would be hit next. "That's what we're trying to price into the market...A lot of the manufacturing comes out of Asia. That would be an import. That could be tariffed. The flip side is we export our technology. That gets manufactured in iPhones and largely built over there. When it comes back, it's an import again. it's a pretty complicated supply chain. We certainly importing more than we export. You're certainly going to see major chip players taking a hit here," Hogan said. However, Scott Kessler, head of equity research at CFRA, does not expect most tech names to take a major hit on tariffs. "There's no question there will be some issues. For most companies, it's relatively minimal. There's a handful of exceptions. Apple is probably a notable exception. About a quarter of its revenues have been from China, but I think that it's not as much as an issue for the tech sector, it's more for many other sectors." Kessler said one way the industry could be impacted is by stricter regulation of mergers, meaning Chinese buyers could face even stiffer scrutiny if they were to seek to buy a U.S. chip maker. Qualcomm's plan to buy NXP Semiconductors, meanwhile, was scuttled after Chinese regulators failed to approve the $43 billion merger.